On The Possibility That The McMinnville Photos Show A Distant Unidentified Object - Maccabee. This paper was originally published in the proceedings of the 1976 UFO conference of the Center For UFO Studies (CUFOS). This version has been modified slightly in April 2000 for this publication. This is the first of two technical and historical papers on the Trent photo case that were presented to and published by CUFOS in Chicago Illinois. 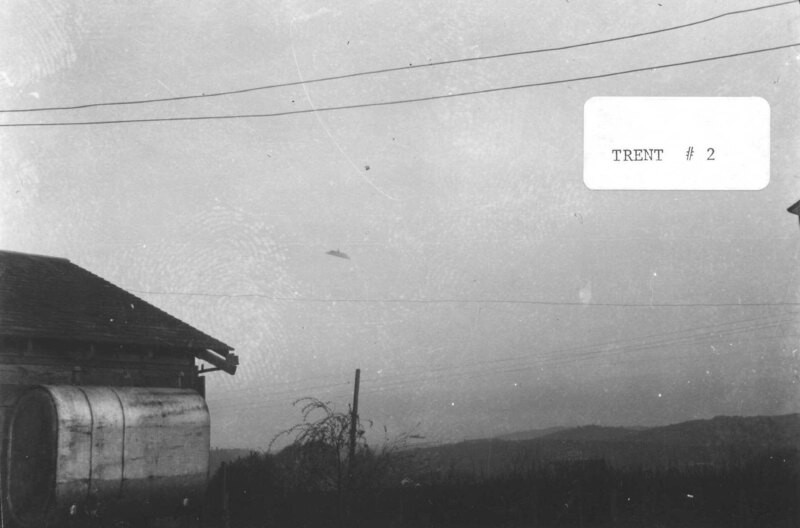 During the Air Force funded investigation of UFO reports at the University of Colorado in 1967-1968 (the "Condon Report"), photoanalyst William Hartmann studied in detail photographic and verbal evidence presented by two former residents of McMinnville, Oregon, Paul and Evelyn Trent. He concluded, mainly on the basis of a simplified photometric analysis, that "all factors investigated, geometrical, psychological and physical, appear to be consistent with the assertion that an extraordinary flying object, silvery, metallic, disk shaped, tens of meters in diameter and evidently artificial, flew within sight of two witnesses." An important part of his analysis included calculations of the expected brightness of the image of the bottom of the Unidentified Object (UO) that appears in the first photo. He pointed out that the elliptical image of the bottom was brighter than expected if the object were close and therefore a small model. The excessive image brightness led him to conclude that he object was at a great distance (over a kilometer), His conclusion was criticized by Philip J. Klass and Rober Sheaffer who argued that veiling glare (caused by surface dirt and imperfections in the lens which scatter light from bright areas of the image into all other areas of the image) could have increased the brightness of the image of the UO, making it appear distant. This investigation revisited and improved upon Hartmann's method with the following modifications: (a) the bottom of the UO in the first photo has been assumed to be as intrinsically bright as possible without being a source of light (i.e., assumed to be white); (b) laboratory measurements have been used to estimate the magnitudes of veiling glare added to the various images of interest; (c) a film exposure curve has been used to determine relative image illuminances; and (d) a surface brightness ratio, determined by field measurements, has been included. The results of the new photometric analysis suggest that the bottom of the UO is too bright for it to have been a non-self-luminous white (paper) surface of a nearby object. Hence it could have been distant. In June 1950, four weeks after they were taken, the photos illustrated in Figures 1 and 2 appeared in the local newspaper in McMinnville, Oregon. Subsequently, they appeared in Life Magazine and in many publications, devoted to UFO reports. Although they clearly depict an unusual object, they were never treated as scientifically valuable because it was always considered probable that they were photos of a hoax object (e.g., "a garbage can lid"). Nevertheless they did gain a large measure of scientific "stature" when, in 1968, Hartmann(1) concluded that the object may have been distant and, therefore, large (i.e. not a hoax). Since the publication of Hartmann's conclusion in the "Condon Report" (1) these photos and the verbal evidence associated with them have been the subject of a continuing controversy. Publication: 8 June 1950. The Editor stated that "expert photographers declared there has been no tampering with the negatives. (The) original photos were developed by a local firm. After careful consideration, there appears to be no possibility of hoax or hallucination connected with the pictures. Therefore, the Telephone-Register believes them authentic." - The Telephone Register, McMinnville, Oregon. 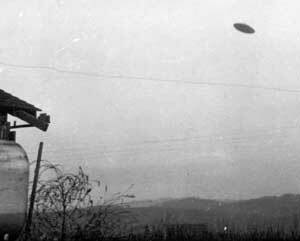 The photos were "lost" in the files of the International News Photo Service and subsequently in the files of UPI until they were "found" by the Condon UFO study project in 1968. Sheaffer-Klass Conclusion (1974):(1) There are some possible inconsistencies in the verbal evidence and several important discrepancies between the verbal report and the photographic evidence. (2) Hartmann's photometric analysis was incomplete. Specifically, (a) shadows on the garage wall (facing east) suggest that the pictures were taken in the morning, not in the evening as claimed; (b) the apparent shrinkage of the shadow nearest the edge of the garage suggests that there were many minutes between photo 1 and photo 2; and (c) veiling glare could have made the image of the bottom of the UO excessively bright thus leading Hartmann to erroneously conclude that the object was distant. Present Investigation (1976): New testimony (published in a companion paper to this) has been obtained and the original negatives have been studied photogrammetrically as well as photometrically. The present investigation has confirmed that there are shadows on the garage wall (agree with (a) above), but has found that, to within the resolution of the measurements (using a traveling microscope), the shadows other than the one at the edge of the garage did not move with respect to the garage wall between photos (the shadow at the edge of the garage does appear narrower in photo 2)(disagree with (b) above). The present investigation has reviewed and confirmed the general validity of Hartmann's analysis. When the effects of veiling glare and the ratio of brightnesses of vertical and horizontal surfaces have been accounted for the Hartmann-type analysis again indicates a large distance (disagree with (c) above). The initial analysis was carried out by a photographer (Bill Powell) who worked for the McMinnville Telephone-Register (now the News Register). Hartmann confirmed the original analysis and went on to conclude that the object was asymmetric and that it was probably not rotating about a (nearly) vertical axis (i.e., was not thrown into the air). Hartmann pointed out that the possibility for a simple hoax existed since the photos show the UO as appearing to be "underneath" two nearby power wires. However, he carried out a simplified photometric analysis which led him to conclude that the object was distant and that "the simplest, most direct interpretation of the photographs confirms precisely what the witnesses said they saw." A modified version of Hartmann's analysis will be presented in the next section to illustrate the use of photometry. In 1974 Philip Klass (2) published an analysis of the verbal evidence by himself and of the photographic evidence by Robert Sheaffer (2,3). They found a puzzling inconsistency between the photos and the verbal description: the photos show clear shadows on the east wall of the nearby garage, which implies that the pictures were taken in the morning, while the witnesses claimed that the pictures were taken in the evening. Sheaffer argued, on the basis of measurements of the width of the hadow othe eave rafter at the corner of the garage, that there was a considerable time lag between photos rather than "less than 30 seconds" as claimed (see Figure 3). However, Sheaffer's most important "discovery" was that dirt on the camera lens, or a poor quality lens, could have caused light from the bright sky surrounding the image of the UO to "spill over" onto the image of the UO, thus making the UO image excessively bright. In Hartmann's analysis the excessive brightness was attributed to the effect of the atmosphere on the apparent brightness of an object if it were distant. By attributing the excess brightness to a camera defect, Sheaffer was able to argue (qualitatively) that the distance calculation was in error and that "in reality" the object was close to the camera. He was, thus, able to remove the main inconsistency with the simple hoax hypothesis: the object, a model UFO, was hanging from wires that were less than twenty feet from the camera. In late 1973, unaware of the work of Sheaffer and Klass, I decided to undertake an investigation of the McMinnville case because (a) the pictures are so clear the object is either a hoax device or an unusual object (no misinterpretation seems possible; e.g., it's not a plane at an odd angle), and (b) Hartmann had devoted considerable effort and analytical research to the photos and had concluded on the basis of this physical evidence that the object was distant (not a hoax). Considering the general tone of the Condon Report (skeptical), I felt that Hartmann must have been quite confident to publish the conclusion he drew from his analysis. He could have decided to do no photometric study and then he would have been "safe" in saying that the case provided "no probative evidence" and that, furthermore, it was probably a hoax. Or, he could have reported the photometric study with such disclaimers as "the photos are so poor (scratched, worn, etc.) that the photometric study is probably narrow by a considerable amount." (NOTE: Dr. Condon wrote in the executive summary chapter that photoanalyst Everitt Merritt, who was not a part of the Colorado University UFO research project, had already "thrown out" the photos as being too fuzzy for worthwhile photogrammetric analysis. But photogrammetric analysis, which makes use of angular separations of images, is different from photometric analysis, which makes use of relative image brightnesses. I am certain that Condon knew the difference between photometric and photogrammetric analysis. It appears that he tried to "cover up" the success of one [photometric] with the "failure" of the other [photogrammetric] by not mentioning Hartmann's analysis in the executive summary of the research.) Dr. Hartmann did point out that his analysis might only be correct to within a factor of four, but, even with an error bar this large, several hundred meters was the closest distance compatible with his analysis. Since Hartmann had essentially endorsed the photos as probably genuine, I decided to try to either confirm or refute his result in a study of my own. Since I was somewhat skeptical myself, I fully expected to be able to show that either the atmospheric theory he used or the photometric measurements were wrong (or incorrectly applied). After a several year study, I have concluded that the general form of Hartmann's analysis is valid. However, I have found that he ignored or was unaware of several "details" of the necessary photographic analysis which will be outlined in the following section. I was not able to confirm the specific numbers which he gave as relative brightnesses of various images on the photos. At least part (perhaps a major part) of this discrepancy is due to a difference in measurement technique: Hartmann measured transmission values of small portions of the images of interest and then divided by the transmission "somewhere" along the horizon; he thus did not have good estimates of average brightnesses of the images. I used a scanning densitometer with a very small aperture and averaged over many scans across an image of interest. However, despite the (not large) difference in the relative brightnesses obtained in the two independent investigations, the conclusions have turned out to be essentially the same, as will be seen.